Unsaturated alcohols and aldehydes with less than 10 carbon atoms are important odour contributors to fresh or raw shellfish flavour. 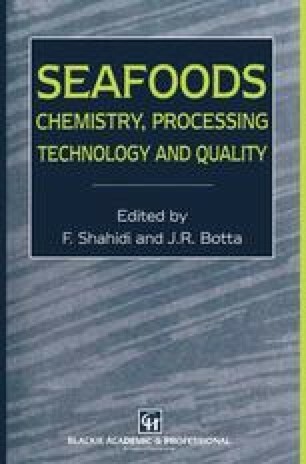 Alkylpyrazines and sulphur-containing compounds have been considered as important contributors to cooked odours of crustaceans. Content of pyrazines, pyridines, cyclic-S-containing compounds i.e. thialdines, trithiolane showed dependence on the content of ammonia, free amino acids and hydrogen sulphide in raw crustaceans, as well as on the heating time and temperature.